Fire Mountain is one of the most unique and spectacular mountaintop hideaways in America. Fire Mountain is located just a few miles outside the village of Highlands, NC on hundreds of acres in the Southern Highlands of western North Carolina, 1.5 hours southwest of Asheville. 2 hours northeast of Atlanta. 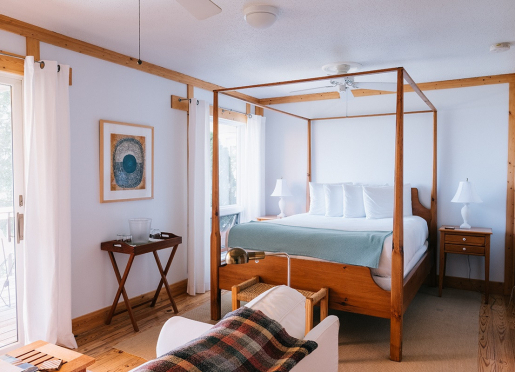 At the highest point on Fire Mountain, at an elevation of over 4,000', sits a secluded mountaintop retreat composed of a sophisticated contemporary Inn, the private and intimate Treehouses of the Inn, and our luxury mountaintop Cabins, all having exquisite long-range mountain views. Fire Mountain is home to Fire + Water restaurant, an exclusive destination restaurant with the best views on the Highlands Plateau. Fire Mountain also offers Ultimate Bliss massages at Air Spa. 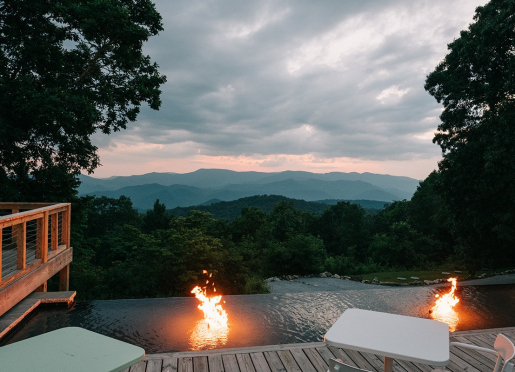 Fire Mountain is secluded and very romantic, with springs, streams, ponds, waterfalls and hiking trails - truly a wonderful retreat from the outside world. Travelers are always looking for memorable and relaxing experiences. Let’s discover more through the words of our innkeepers. Many thanks to Matthew Gillen and Hiram Wilkinson for sharing their own secrets with BBOnline.com! Guests stay with us to get away from the stresses of everyday life; Rest, Relaxation, Getaways, Celebrate Anniversaries. We are best known for long-range mountain views. We are a retreat from the outside world; No TV, clocks, phones. That is what sets Fire Mountain apart from all of the other properties in our area. The beauty of the Blue Ridge Mountains, Climate..the average mean temp in August is 67 degrees. I would have to direct you to our Reviews on Tripadvisor. The best kept secret is the cool clean mountain air and the numerous activities in the area. 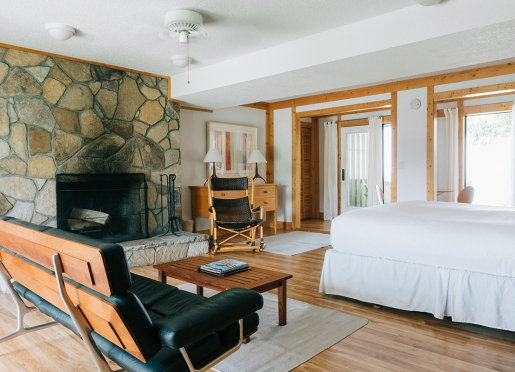 Guests come to Fire Mountain to relax and rejuvenate. Hike and visit waterfalls. Visit upscale Shops and Galleries. Fire + Water restaurant is definitely our favorite. It is the only restaurant on the Highlands Plateau with long-range mountain views. All of the ingredients are sourced fresh from local farms or are grown right here on Fire Mountain. It is truly a one of a kind experience. 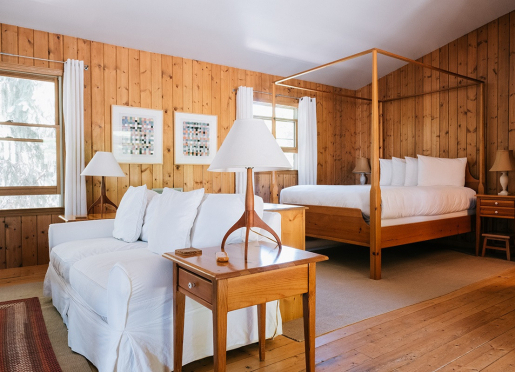 Fire Mountain Inn provides a wealth of information on the area when a guest makes a reservation. A Hiking guide, restaurant guide, helpful hints guide to the area. We have nine rooms and six cabins. We are pleased to accept dogs in our cabins at Fire Mountain. Our pet policy is on our website in the “About Us” section. 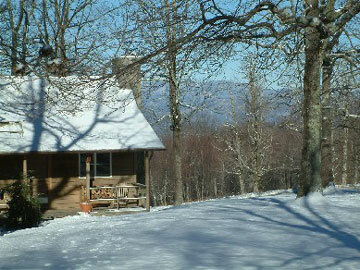 Fire Mountain is pleased to welcome dogs in our cabin accommodations. We accept dogs under 80lbs, over a year in age and that are house trained and not paper trained. There is a pet fee of $25 per day and a security agreement that is acknowledged by the pet owner at check-in. Please visit our website for our complete pet policy, which is located at the bottom of each page of our website.